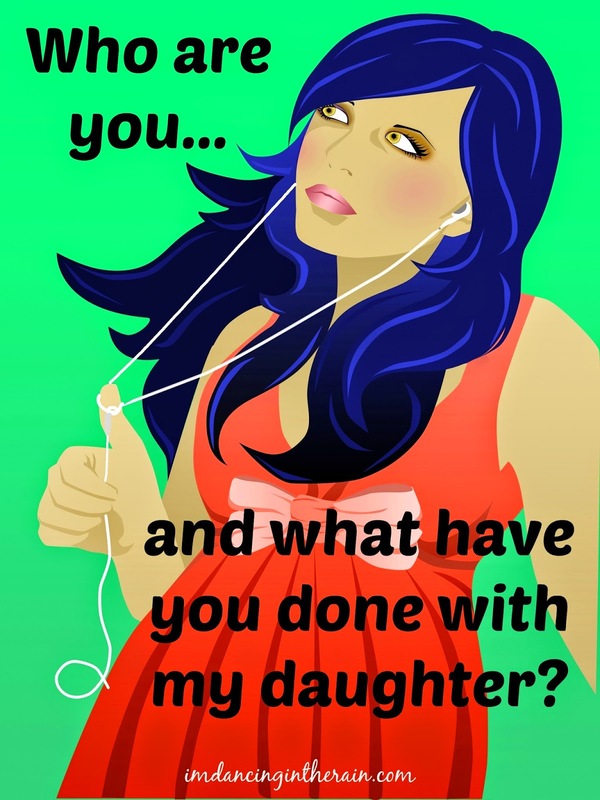 Dancing in the Rain: Who Are You and What Have You Done With My Daughter? Every single year something changes in you. Often it starts the month before your birthday in July. For example, when you turned 14 last year you finally began having more of an opinion on what clothes you wanted to wear. You also got very into anime. I thought that might be the extent of the changes for this age. Boy, was I wrong! Everything about you morphed into something different after starting high school. During the first four months of this school year, you went from being my sweet, funny, quirky little girl, to a full-fledged adolescent with an attitude to match. Speaking of not telling me things....I am almost literally beating my head up against the wall over how tight-lipped you've become. I am the kind of mom who has tried your whole life to foster a relationship in which you'd feel like you could tell me anything and everything, ask any question. And it seemed like you were on board with that....until recently. I mean, it took over a month to find out you had a boyfriend! You didn't tell me about your very first boyfriend! The only way I was able to know was because your friend ratted you out. I suspected, but you refused to confirm, in fact outright denied, that he was anything more than a friend when I tried to inquire about who this boy was. And now that I know, will you tell me anything about how you feel about him? Nope. Thanks to your friend, we got to meet him and get to know him a little over dinner. I must say, he seems like a great guy to be your first "bf". Your dad doesn't even feel the need to threaten his life. Anyway, back in December, like I mentioned, right before the Holiday break, I got this gut feeling that the ADHD medication you've been on for years wasn't good for you anymore, so we took a "med holiday" while school was out. I know you didn't appreciate my dragging you to see a specialist, but it sure made me feel better to know my gut was right, and to have another option to try. Oh yes, my dear, I know you are very irritated by my insistence that we try the new medication. You've made that abundantly clear. You think you should suddenly just try to "handle" your ADHD all on your own, without medication or help from anyone. I have no idea where this stance is coming from....besides simply a contrary teen thing. Of course I knew you would develop your personality and change as you grew up. But I really didn't expect the complete 180 you have done. It has thrown me for a serious loop. I feel like I'm getting to know you from scratch, and I kind of miss my little girl. She comes out here and there, like the way you still call us "Mommy" and "Daddy", but you do also think we should leave you alone and just "let me live my life!". Push and pull. Are you a kid or an adult? You're trying to figure it out. Let me attempt to clear it up for you: You're on your way to adulthood, but you are absolutely still a kid. And yes, we are still in charge, not you. You've gotten good at telling me what I want to hear so I'll tell you what you want to hear. Oh yeah, I know you're doing it. Sometimes I let you, other times I don't. You won't know which way I'm going to go, any more than I'll know what mood you'll be in from moment to moment. I think it's fair. Look, we're in this together, whether either of us likes it or not. You've got to grow up, and I have to parent. These two things aren't always going to mix well. But know this: I am your mother and I love you unconditionally. I have known you since before you were born. I'm not perfect, but I do have a clue. No matter what you do or say, no matter where your life takes you, I will always be your soft place to land when you need one. Linking up with the 5 year anniversary of Pour Your Heart Out, and the One Word Blog Challenge for the word "quiet" (read: tight-lipped)!